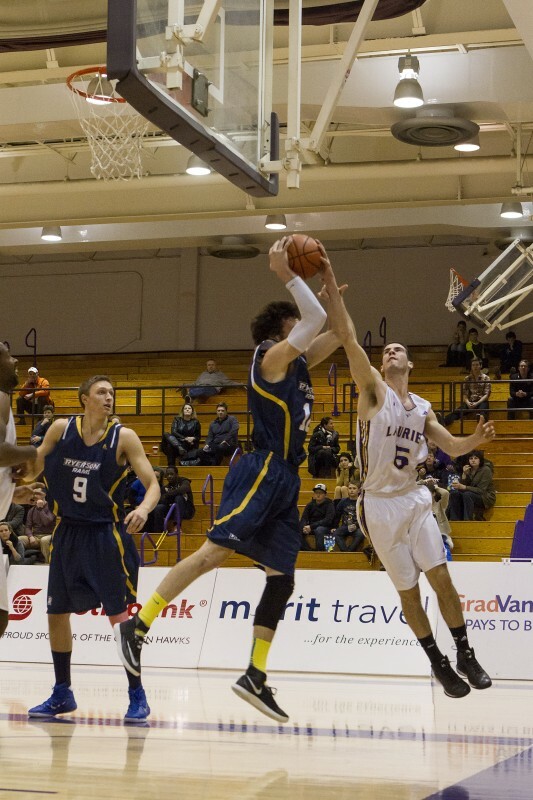 In what was a gloomy end to a gloomy season, the Ryerson Rams handed the Wilfrid Laurier University Golden Hawks men’s basketball team a resounding 105-59 loss to eliminate them from the Ontario University Athletics playoffs. The road to Ryerson took the Hawks through London for a first-round matchup against Western. Having lost by 28 points to Western just a week before, the Golden Hawks were out for revenge. “Getting that win against Western was really big for us, really made us feel good after they pounded us the week before and beat us twice on the year,” said captain Will Coulthard. The slashing senior guard eviscerated the Mustangs defence, driving home 34 points and willing the Golden Hawks to a 90-82 win. However, facing a 17-2 Ryerson team in the second round, Coulthard and the Golden Hawks were in for a more daunting set of challenges. “We knew we had to play a great game to win. We went in with a positive mindset. We kept it close for a while but they were just really good, executed way better than us and stopped us defensively and we couldn’t do much,” Coulthard said. The Rams effectively stifled Coulthard, holding Laurier’s main offensive threat to a measly 4 points on 1-9 shooting. Deprived of scoring firepower, the Golden Hawk attack smoldered and was snuffed out. After a 21-point first quarter, Laurier was limited to just 38 points the rest of the way. “They didn’t leave me all game, they knew they had to stop me. It was hard to get a shot off and they made it difficult,” Coulthard said. While the lack of scoring output played a large role, the back-breaker for the Golden Hawks was the rebounding deficit. Every Ryerson starter pulled down five or more rebounds, while no Golden Hawk player captured more than four. The Laurier defeat put the cap on a season that was rife with unmet hopes and expectations. Having finished the regular season at 7-13, the Golden Hawks felt they had not played to full potential. “I think we could have been much better than 7-13. Certainly the loss of Jack [Simmons] at Christmas hurt, but even then I thought we needed more guys playing closer to their ability, so that was frustrating,” said Campbell. “We’ve got to play harder throughout the whole season. There were some times where just didn’t compete and we lost some games that we shouldn’t have,” added Coulthard. Despite this, both coach and captain feel confident that the appropriate adjustments and an influx of new talent will bring about a change in the team’s performance. “There’s only two ways to get better — the guys we have need to work really hard this summer to improve and grow their games, or we have to bring in better players,” said Campbell. “We’ll get some guys coming in and there’s an opportunity for everyone to step up, hopefully we can be better next year,” added Coulthard, who will return next year for a fifth season. Campbell looke ahead to the upcoming 2015-16 seaosn.